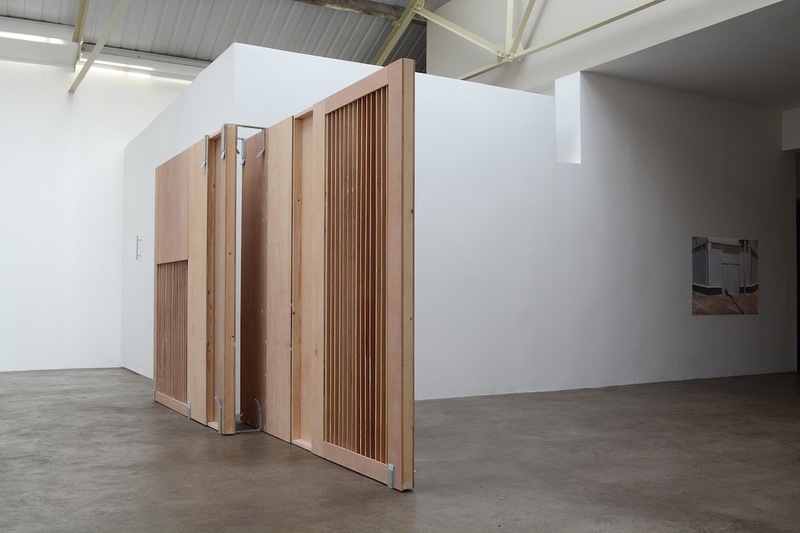 Áine McBride, Untitled (wall), 2018, plywood, timber, gesso, paint, welded mild steel fixings. Photo courtesy the artist and mother’s tankstation Dublin | London. 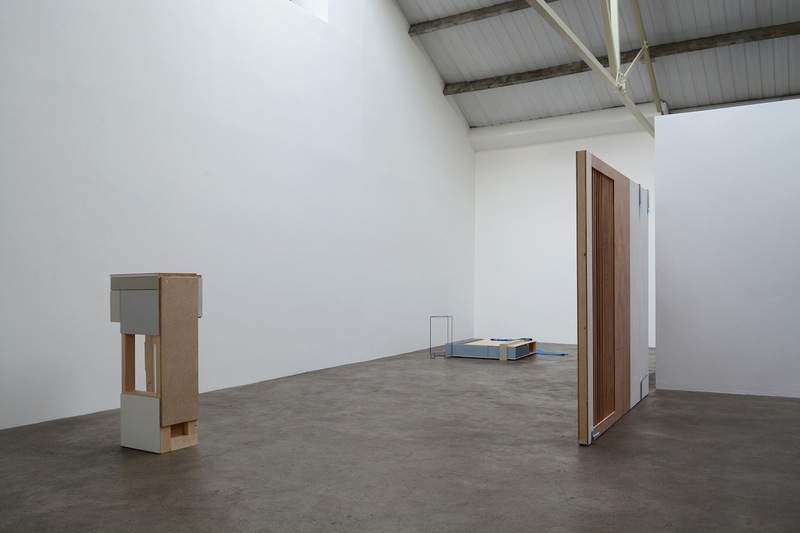 Áine McBride, work suite, 2018, installation view. Photo courtesy the artist and mother’s tankstation Dublin | London. 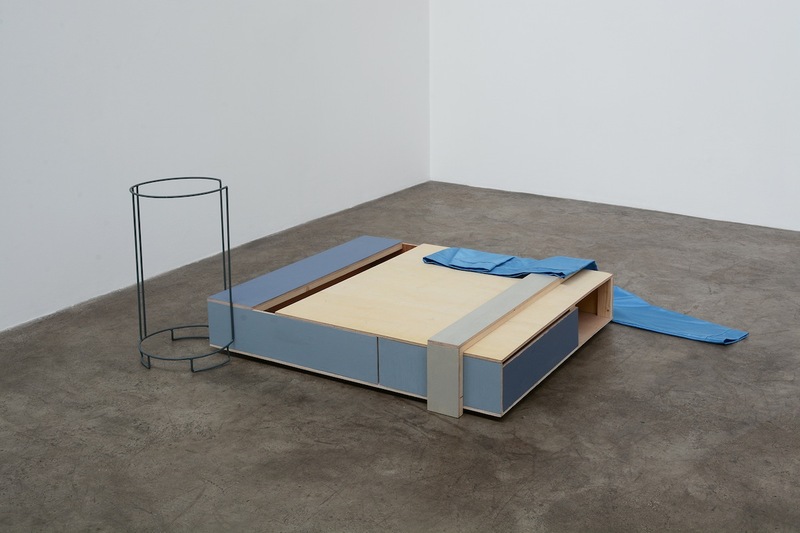 Áine McBride, floor unit, 2018, plywood, timber, formica, paint, mild steel, fabric. Photo courtesy the artist and mother’s tankstation Dublin | London. Pool slides once belonged only to the working class. Generally speaking, anyone who wore them cared more about practicality than style. The same can be said for tote bags and French workers’ jackets. At one time or another, all of these things belonged to the proletariat due to their low cost, availability, durability and practical use. And one by one throughout the 20th and 21st centuries, each of these items fell under the glamorous gaze of highbrow contemporary fashion designers. Plucked from the fields, the showers and the cash-and-carries, these accessories were soon reimagined inside the walls of metropolitan fashion houses and redistributed throughout the social elite, ending up at the Frieze London preview a couple of years ago where I was having a veritably awkward and self-conscious time. In no way did it seem like anyone at this fair was wearing pool slides out of sheer practicality. They were almost all fluffy, each pair more immaculate than the last. Thoughtfully pieced together with a freshly-pressed, indigo-dyed French worker’s jacket and a glass of rose-tinted champagne in hand, and the look of the day was a sauntering ‘practicality on show’: a bombastic uselessness at once repulsive, laughable, and utterly fabulous. The Frieze London opening is more often than not an overwhelming, anxiety-inducing experience during which all of the guests’ hifalutin fabuloso becomes far more memorable than any of the blue chip art filling up space between the booths. And now, just as designer loungewear and normcore states of mind have spread throughout common consciousness, this exact strain of stylish desire, so cool and aloof yet dripping with confusion and desperation, has been seized upon and fed back into the art world by Irish artist Áine McBride. In her first solo show, work suite at mother’s tankstation, McBride presents a quiet, post-minimalist and mostly sculptural exhibition that embraces the benign material of the everyday civilian: the stained and grainy surfaces of real life that the art world so often seems to want to eclipse with its absurdly assured artist statements, its suspiciously crisp concepts, and its plush international art fairs. Exposed concrete, mild steel and bare plywood immerse McBride’s show in a numbing greyed palette; one that is easily experienced on a regular basis when commuting through almost any stretch of a 21st century town, whether it’s passing by a boarded-up shop front, leaning on a flatpack counter top or gazing at goods neatly composed on a retail unit. Sad in real life, for sure, but between the cold gallery walls this skeuomorphic melee of mundanity comes across as oddly reassuring. McBride’s objects add up to nothing much other than a mass of directionless matter, the kind that is systematically shaped and fitted to fill up space and guide your gaze to the next point of view, and then the next. ‘Desire lines’, as they’re known in urban planning, are subtle routes traced into our environment that encourage us to move through space in certain, preferred ways. But in work suite, McBride appears to use this technique against itself, scrambling the formula in search of a clarification beyond that which is already prescribed when wandering. Everything in this show looks like it ought to be useful, but is decidedly not. Instead, the idea of use itself is primped and preened, and shuffled out on stage for all to see. One take on the blue worker’s jacket even makes an appearance on a piece matter-of-factly titled floor unit. Worn predominantly by the farmers and the railway workers of the 1800s, these garments became popular amongst labourers for their ability to resist dirt and wear – before the ‘utility look’ was ever considered a thing. Without a crease in sight, the jacket’s lower half is draped over a pallet-shaped unit of bare and blue-painted plywood and timber. Its right-hand side folds over itself in a careful display that wouldn’t look out of place in the vintage section of an Urban Outfitters, meanwhile a bin’s skeleton straddles the unit’s opposite corner. With no body in the jacket and no bag in the bin, the mind naturally drifts to what’s ultimately missing, or being missed. The most imposing presence in the room is undoubtedly Untitled (wall). 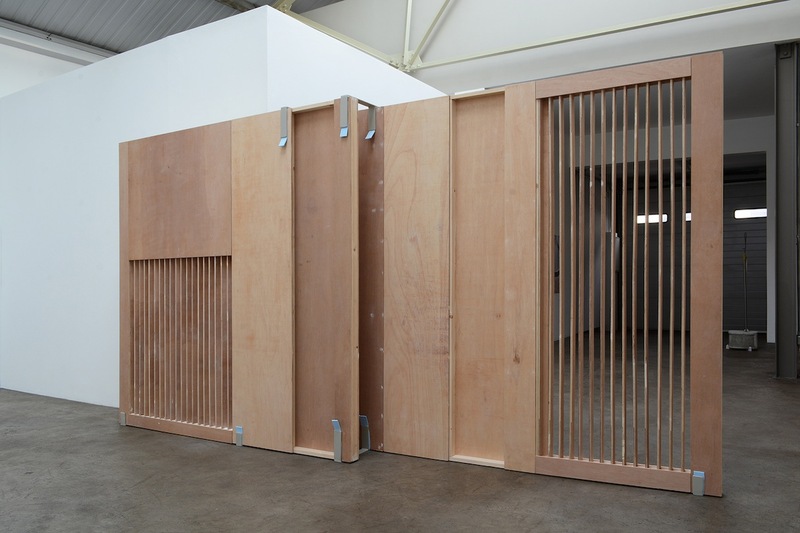 Jutting out from the gallery’s own white walls, this almost two metre high and mostly bare plywood structure interrupts the natural route throughout the room. Fitted with slim slats, little soft blue lips peck the tops and bottoms of its surface. More of a room divider than an actual wall, again McBride flirts with purpose. What’s missing in this scenario is the private area that a room divider suggestively covers up; a space for dressing or getting undressed, partially visible through the slits. But of course as the title suggests, this is not a room divider at all, it is a wall. At this moment more than ever in work suite, McBride heralds the wrong and the confused, and with an arsenal of scraps as if taken straight from IKEA’s defective pile, sets her sights on the gauntlet that is the rhapsody of the fluffy Frieze pool slide. It goes without saying of course that McBride is certainly not the first artist in history to put the idea of use itself on show. What is especially disconcerting however is not the ocean of pre-fabricated material that makes up so much of our contemporary world, but the sheer ubiquity of pre-fabricated taste – be it in the fashion world, the art world, in the comfort of your own pristinely tiled kitchen, or in the bevelled balconies of your apartment building. It’s inescapable. The question is, at least for McBride in work suite, how best to respond to this perforating malaise? If fashion designers can dictate what clothes you wear, architects can dictate which directions you walk in, and art fairs can dictate which artists you look at, McBride works from within the confines of this taste-making system to use ambiguity as a means of cold, hard, heart-swelling refusal. Niamh McCooey is a writer and critic based in London.